Thank you for your interest in our tendon study, however recruitment of participants is now closed. Please check back later in 2016 for updates from this trial and exciting news on new trials to start in 2017. Have you suffered from chronic pain in your Achilles tendon for more than six months? If you do, you might be suffering from chronic Achilles tendinosis. Chronic Achilles tendinosis is a degenerative disease of the tendon. It is caused by a cycle of injury, improper healing and re-injury. This can result in ongoing pain and loss of function. It is often caused by sports related injuries, occupational overuse, aging and general health. Chronic Achilles tendinosis affects both physically active and inactive individuals. Tendinosis accounts for 30 to 50% of all sports injuries and 50% of occupation-related disorders in the United States. Tendons are specialized tissue that attach muscles to bones. A normal healthy tendon is comprised mostly of water and a substance called collagen. It is collagen that allows a tendon to flex and stretch. Individual collagen fibrils arrange themselves into bundles which are called collagen fibres. These fibres are arranged with other fibres to form a fascicle which group with other fascicles to form a tertiary fiber bundle. Tertiary bundles grouped together form the tendon itself. Contained in between the tertiary bundles, fascicles and fibrils are nerve fibers, blood and lymph vessels. A cross section of a tendon shows a highly organized pattern of structures which reflect the function of the tendon. The network of nerve fibers, blood and lymph vessels communicate with each other to detect and respond to loads applied to the tendon. There are cells in the structures of a tendon that help maintain and repair the tendon in response to degradation from aging or damage. When mechanical loads exceed the strength of a tendon, which may be compromised by aging or previous injury, small tears in the network of collagen structures may occur. In response to damage, cells within the tendon attempt to repair the collagen network. However, such repairs tend to be incomplete and an injured tendon never returns to its original state. Tendon injuries can be caused by factors such as age, body weight and nutrition. They can also be caused from forces related to sports injuries, excessive loading, poor training techniques and environmental conditions. A common form of tendon injury is called tendinitis. Tendinitis is a tendon injury that has happened quickly (quick onset or acute) and is associated with pain and swelling. With rest and appropriate treatment; tendinitis usually heals completely over a period of a few weeks. 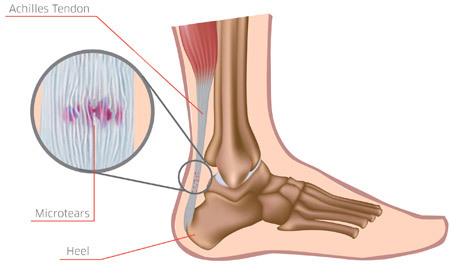 By contrast, tendinosis is a tendon disorder related to accumulation of small tears in the tendon structure over time with little, if any, inflammation. 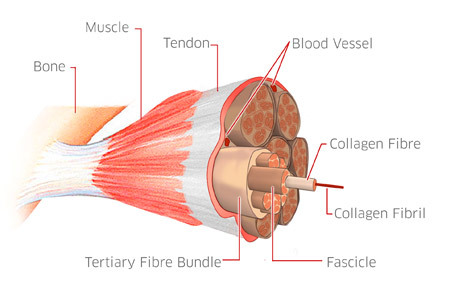 Accumulated injuries can result in the formation of a disrupted collagen fibre network, because cells within a tendon do not completely repair damage. Critically, the new collagen produced in response to an injury is abnormal in structure and composition leaving the tendon weakened with a decreased load bearing tolerance. An improperly healed tendon is prone to further injuries including significant exposure to rupture because it does not return to its original strength. In chronic Achilles tendinosis, pain and reduced function are part of a worsening cycle of healing and re-injury. This cycle often ends with few pain free and functional periods and the injury enters a degenerative stage. The poorly structured network of collagen structures in tendinosis result in a reduction in the overall tendon strength. This can often result in re-injury or complete tendon rupture. Slow healing and chronic debilitating pain is difficult to improve or manage with currently available treatments for tendinosis. Some common approaches involve physiotherapy, drugs, injections of steroids or other products or other forms of therapy. The effectiveness of these proposed treatments are often debated. None of the methodologies offer a satisfactory recovery from tendinosis and often leave patients demobilized for several months during treatment. Therefore, advancement in how we treat tendinopathy is urgently needed. Click here to learn about a clinical research study being conducted in tendinosis.